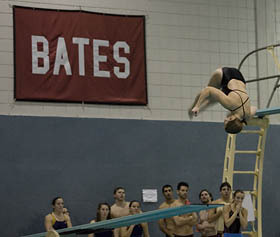 The team headed north this past Saturday to take on the Division I University of Maine Black Bears. This is a perfect end of the semester meet against top level competition. I can't say for sure, but I do believe University of Maine saved their best meet of the semester for us. And with this being their 8th meet of the semester they were well tuned for competition. Your Bates Bobcats who just wrapped up the toughest two weeks of training I have witnessed here - came into the meet with extremely impressive practice times and accomplishments amid all the hard work in the pool and the weight room. When all was said and done, I believe the team as a whole wished we were a little sharper and speedy - but when you have over 20 performances from your upperclassmen that were faster than last Fall, freshman that were faster than their first dual meet, and divers posting the best scores of their lives... well there is simply no reason not enjoy the silver lining in finishing up the semester with two losses (see results here). • FY's Matt Gagne and Alex Smachlo 1-2'ing the competition in the 200 fly. • Nick Karlson with his best in-season splits and 100 free time! • Geissinger's amazing finishes... and very impressive times in the 50, 100 and 200. • Kara Leasure and Emily Tato showing off their endurance with a 1-3 come from behind 400 IM finish. • Mallory Ward transitioning from a national level rower to a darn fast breaststroker. • Kristen Barry and Sarah Bouchard nearly going LTB in their 500 frees! • and of course Tom Boniface going undefeated individually in the 200 free, 100 free, and 200 IM. The cool thing about watching Tommy Bon this past weekend was his undeniable will to finish off his races better than anyone around. In fact, with a 50 to go in every single race... he was losing!! Can you believe that?! He even dove in behind in the 400 free relay and passed the guy there too. Wow. Tom, those mentioned above, and many more on the team seem to be on a mission this year - and what is distinguishing them from their competition is how mentally dialed-in they are right now. I know others are working just as hard, and succeeding in practice too, but I am betting very few out there are more engaged in every aspect of the sport. From the training, to the race strategy, to the simple goal of staying in the present moment... every aspect is working together right now. Dialed-in. That is the best way for me to describe it. Ultimately, I think that is the best way to turn goals into reality. Way to go T-Bone! Keep it going, stay focused to NESCACs and BEYOND! Major props to all Bobcat swimmers, you guys rock!